This year, the team of Sol Kom Yo has decided to make great efforts to install water filters in schools so that hundreds of pupils can have access to safe drinking water. Therefore, a new project, focusing on water Filter delivery, is about to be launched in and around Ouanaminthe. SolKomYo will team up with Cha rles and Alexandra Adams from the international Rotary Club, for the production and the delivery of the water filters in areas where the community is very vulnerable to waterborne disease infections such as schools and hospitals. Those filters are built with the NOK hollow fiber membrane technology , whose the 0.1 micron polysulfone HF membranes can consistently reduce the bacterial loadin contaminated water by greater than 6.0 log10 [>99.9999%] while achieving greater than 4.0 log10 [>99.99%] reduction in Cryptosporidium parvum oocysts. These figures ,based on the experiments carried out by the Microbiological Laboratory of the University of South Florida in St. Petersburg (Florida) , demonstrate that the removal efficiencies level of these water filters exceed the Environmental Protection Agency (EPA) Guide Standard and Protocol (USEPA GS&P) performance criteria for removal of bacteria and protozoa. This ground-breaking technology can make a significant impact in several schools of Ouanaminthe. Indeed, several studies have demonstrated that the consumption of clean water can reduce the incidence of diarrheal diseases by more than 50%. Furthermore, we need to bear in mind that there is a tight link between a students’ learning capabilities and the access of free drinking water on schools premises, since the lack of clean water has serious effects on student’s academic performance and attendance rates. So, we are convinced that the presence of good water filters will ensure an access to reliable drinking water points, which will provide proper hydration to the kids and improve their physical development and academic performances. 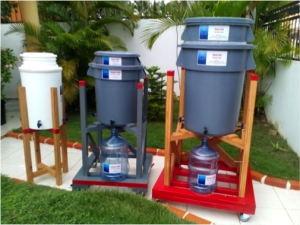 In the schools involved with the project, the teachers and students will be asked to ensure the proper preservation of the equipment and will be trained on basic maintenance techniques to reduce the risks of failure and decline of the water filter. Before starting the deliveries of water filters , SolKomYo will conduct a research surveys on water and sanitation in several areas of Ouanaminthe in order to discover the identify the exact needs and expectations required to meet the needs of the targeted schools and communities.